If he thinks he can go any distance with that set up he's got bricks in his head. The new Indian helmet laws are a bit extreme. You can run out of bricks but you can't ride out of them. Domino's?? I thought they said mobile pizza oven!!!!!!! When making his wish he told the genie he wanted to get laid. 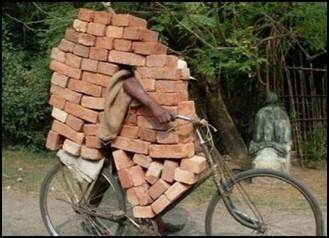 The re-cycled brick business was proving hard work. Donald Trump's first day at high school. When your Portaloo must be built like a brick shytehouse. Rajesh is a big Pink Floyd fan. Somalian armed personnel carrier going into battle. Obviously hes a speed cyclist and he needs a little extra weight to keep the front end down. 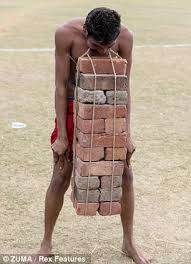 The Indian Times - "Man arrested for peddling bricks"
Sheet a brick and fart a wheel barrow . After this, Frank decided he would no longer volunteer to take part in the crash test experiments at Nixeycles. Donald, getting a head start. arghhhh. I told him that the bicycle path would be better to ride on if you just used more bricks man.